It just doesn't show up for me in the list. 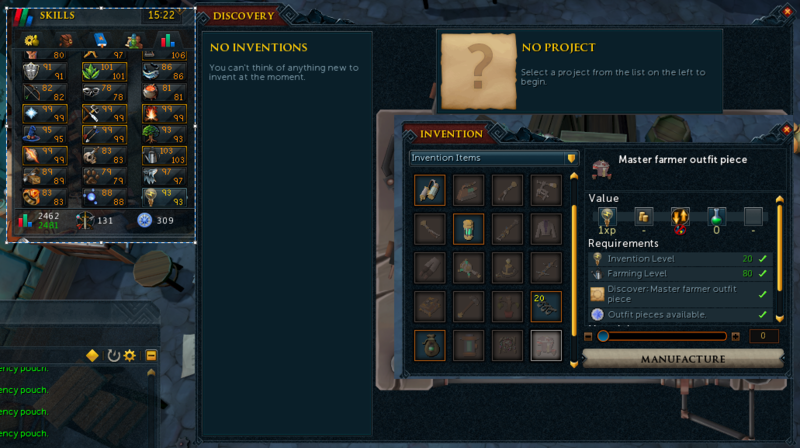 I do have maxed shark fragment stack, I simply forgot to include it in the picture. are there any requirements that I don't know about? (I did read on the RSwiki without success). (also, master farmer outfit is the last item on the list. and above the Tool Gizmo is the divine Charge/augmentor/weapon gizmo/armour gizmo). What did I miss, why can't I craft shark outfit? And no, I don't have it in my bank nor at Diango. Did you discover the blueprints at the workbench? What's under the master farmer outfit? it looks like you can scroll down even further. I relogged just now and now I can craft it, weird.